My heart is forever blossoming. ~Ally. Photograph: ©Alison Lee Cousland. I will be with you there. The idea for this ice-scape was to form a rock-pool with a ‘natural’ appearance with just a hint of it being heart shaped. The rock-pool had already been formed by a scattering of small rocks, sculpted to leave the shape of a heart at the centre. Some tiny spiraling shells were added before water was trickled in, completely covering the arrangement without disturbing the formation. After the water was frozen, a few more smaller rocks were added before groupings of larger rocks were placed a little further out. A few more shells were nestled between the rocks, above the ice level. 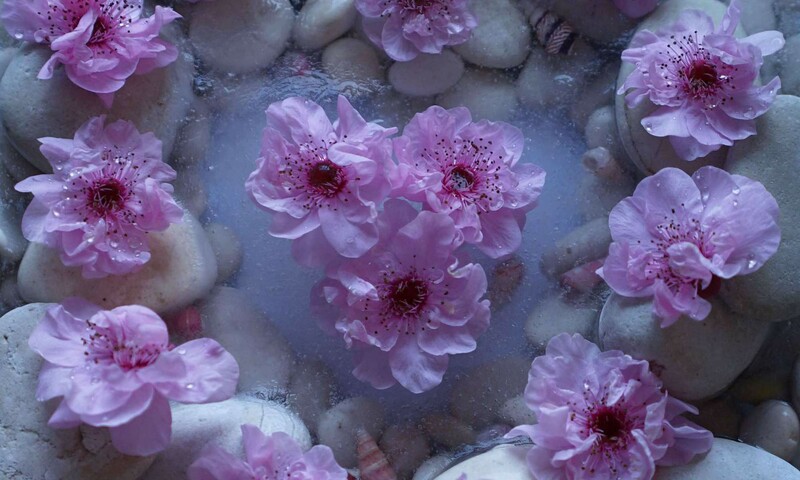 The final touch was to add some pink blossoms ~ An inner echo ~ To the centre of the rock-pool. Love is the strongest force the world possesses and yet it is the humblest imaginable. ~Mahatma Gandhi. Another heart was formed with pink blossoms. This time on the banks of the rock-pool. Looks simple? Was actually quite tricky because of the different heights and spacings of the outer rocks. The appearance of Plum Blossom reminds us that Springtime is on her way after Winter’s bitterness ~ Signifying the strength and courage that grows through the endurance of hardship. And a heart of Plum Blossom? Lifts our Spirit ~Opens our heart to see and feel beauty. Supports us in the trust that life will continue to regenerate. Where there is love there is life. ~Mahatma Gandhi. A few bright pink azaleas were placed in the foreground. Adding beauty in vibrant colour and curling forms, transparency and fragility. Like the blossom, the azalea is renowned for its delicate beauty. The flower is a symbol of femininity and womanhood, love and gentleness. Azaleas corresponds to the Heart Centre and suggests to us that we learn to live in moderation, practice temperance and taking care of ourselves and loved ones. The colour pink is also attuned to the Heart Centre and whispers of love and femininity ~ Early awakenings of romantic love ~ A mother’s love filled with tenderness for those she cares for. Pink Plum Blossoms ~ Pink Azaleas ~ Pink hearts. I give myself time and space to reflect. I care for my temple. I eat simply. I breathe deeply. I open my heart. I care for myself. As I care for other beings. My Spirit has trust that life will continue to regenerate. My heart is forever blossoming. ~Ally. Let us work together for unity and love. ~Mahatma Gandhi. Relatively small assemblages are built from flowers, weeds and plants combined with other natural materials that I find in the local bushland or surrounding urban streets. During the creation of these pieces ~ The process is incredibly magical. Thoughts of anything else are silenced. I simply watch as the different elements greet, merge, compliment and/or contrast with each other. I work with the notion that the energy that supported the creation of these assemblages in ice ~ Can be made palpable in these photographs. In viewing these images you may be led to see another dimension to them, from your own reality. I truly welcome other layers of thought. Originally published in more detail at allyinspirit.info on December 30, 2016. Artist ♥︎ Maker ♥︎ Photographer ♥︎ Musing with Words.